Published April 26, 2016 By Anna T. This post may contain affiliate links. Regardless, I only recommend sites I've researched and/or used and trust. Since I started this blog and began posting regular work at home job leads, I've come across several different resources for digging up good information. Many sites I've checked out are free to access while some, like FlexJobs and Contena (which we recently reviewed) are not. While I stand by my recommendation for FlexJobs because I think it offers value for your monthly subscription, I totally get that some people simply do not want to pay a fee to access any site that has work at home information. FlexJobs charges the fee because, unlike many other sites, they don't display ads and they guarantee no scams, so the fee is how they generate their income. But again, some people just can't afford to pay it. And if you're on the hunt for a job, it's pretty likely that money might be more than a little tight anyway. I definitely can understand that. So, without beating around the bush any further, here are the BEST places you can check online for remote jobs, and these sites won't charge you a dime. You know how online forums work — it's basically a huge, online conversation. I think social media and Facebook groups are starting to make these seem a little antique nowadays, but they are still useful and there are a couple of popular ones in the work at home world you should make it a point to visit if you're on the hunt for a work at home job. These are free to join, but there may be ads and you can't 100% trust all the info you find. Remember, the content is created by forum members, and not everyone is to be trusted. Work From Home Arena – You must register as a member first to view posts. They have an entire section for work at home job leads. There are hundreds of work at home jobs posted on Craigslist every single day. Many are legit and, unfortunately, many are not. I created this post to help you learn to navigate Craigslist effectively for remote work and learn to pick out the scammy listings from the legit ones. I recommend either using Adhuntr to do your searching, since it searches all of Craigslist at once, or just sticking to the big city Craigslist sites like New York, Los Angeles, etc. since you'll find more listings on those. The best way to narrow it down to remote listings is by using keywords like “telecommute” “telecommuting” “work remotely” or “work at home.” Make sure to put quotes around your keywords just as I've shown above. Indeed is absolutely amazing! I used to hop around to places like Monster, Careerbuilder, and Job.com for leads, until I discovered that Indeed pulls leads from all these sites and more. I use it 3-4 times per week to hunt up good leads to post here on my blog. Bottom line – it has saved me a ton of time (as it will you) and fortunately they don't let too many scams slip through the cracks. I use it similar to Craigslist and search certain keywords inside quotes. I use “work from home” “work at home” or sometimes I'll leave the keyword field blank and just put “remote” (without quotes) in the location box. The “freelance” keyword is another good one to use since those types of jobs are often remote. It's also a good idea to set up an advanced search and ask it to show you 50 results per page. This also saves time so you're not having to constantly click over to the next page. The default setting is just 10 jobs per page, so unless you change that setting, you will be doing a lot of clicking around. You can find tons of work on these sites with varying rates of pay, and you usually have to place bids to get the work (outbidding other potential workers on rates). Note that some of these sites do have options to upgrade your membership to paid and get more features, but they all have basic levels that are free where you can set up a profile and bid on some jobs. You can use your social media accounts to find current work at home job leads. LinkedIn, Twitter, and Facebook are three of the best to use for finding new leads. On Twitter, I created a list here of some people who regularly tweet job leads out. You can also use search on Twitter to find the jobs, just like you would with any other job board. Type in “now hiring” “work from home” or “work at home” to see what tweets come up. Many companies tweet out their leads when they are in need of new workers. On LinkedIn, you'll find tons of jobs listed. You can go here to see a lot of remote listings. Use the search field at the top of that page to put in your own keywords and find more jobs. 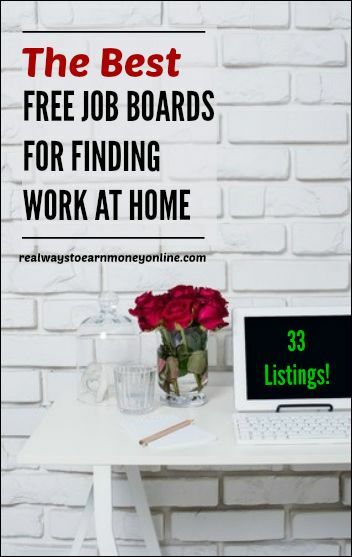 If you're looking to find work at home info in your Facebook feed regularly, be sure and “like” each of the pages I listed in this post. MTStars – Mostly medical transcription listings, but you'll find some general transcription work thrown in there, too. Transcription Essentials – This is a popular forum for work at home transcribers, lots of info on companies that hire. My Transcription Companies List – This is is something I created here on this site, and I do keep it up to date. There are around 100 companies listed, most of which have ongoing openings. More info on home-based graphic design jobs here. Social Media Jobs – very helpful Facebook group. More info here on remote social media jobs. As always, I welcome comments if you know of any other FREE job sites that would be helpful to anyone looking to work at home. I will try to get some more quality sites added to this list as I find them. Good luck in your work at home search! I am very leery of Craigslist after I heard several people had been attacked when they met someone who was selling an item. However, I have been having trouble with Indeed. With my health problems I can o nly work part time, which is what I added to the type of position I was looking for. Almost all of the jobs I get are for full time, I might get one or two that are part time and they are out of my area. Such is my life and I will keep searching. I was leery of Craigslist, but I’m going to try your suggestions for looking there. Thanks, Anna. I came across another one with a great job leads board. It’s a really cool little site. Thank you for letting me know. I removed that listing. This is quite an extensive list, thank you! I have used Craigslist, Indeed, Problogger, and Freelance Writing Jobs. All are great resources! I have also used Tjobs.com…formerly FlexJobs. Never hurts to have a few leads in your pocket of a few great job sites!